Located in the heart of Taguig, this condo building is 0.1 mi (0.1 km) from Fort Bonifacio. I really liked the professional friendly service, the security, and the convenient location to the hospital and shopping. Great Location. Walking distance to Restaurants and Supermarket. Perfect cooling system and strong shower pressure. The building looks cozy from outside but once you get inside ...right in the lobby, it smells bad and when you get inside the unit, bathroom is terrible. The living area and kitchen is ok though. Will not recommend to friends. Where to find Taguig hotels near an airport? 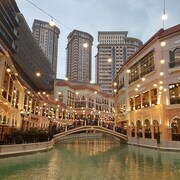 Where can I find hotels in Taguig that are near tourist attractions? 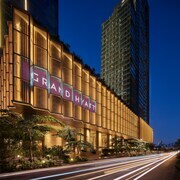 Hotels near Ayala Malls: Market! Market! Visitors to Manila are simply spoiled for choice when it comes to finding quality hotels and apartments in Taguig. Expedia's comprehensive database lists 268 places to stay within a 0.1-kilometre (0.06-mile) radius of the center of Taguig. 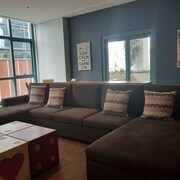 If you are looking to book a hotel that is within a stroll from the Taguig city center, MaxStay - Max Pavilion @ The Venice Residences and Max Style @ The Venice Residences would be perfect. 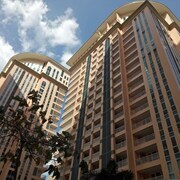 The Raffles Makati is located 7 kilometres (4 miles) away from downtown Taguig. 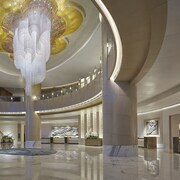 Another alternative is the Makati Shangri-la Hotel, Manila, which is situated 7 kilometres (4 miles) away. 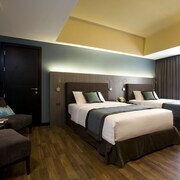 You could also choose to book a room at the Maxims Tower or the Vivere Hotel. Looking to venture a bit further afield? Luzon has a number of things to see. Luzon is marked by rural landscapes, and common Luzon sights include traditional villages and old towns. Common activities in this particular part of Philippines include rock climbing. 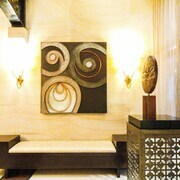 Makati is 7 kilometres (4 miles) to the northwest of Taguig and is home to the Ayala Center and Alliance Francaise. 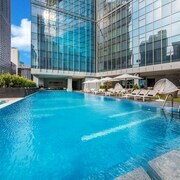 Some of our recommended Makati hotels and accommodations include the Ascott Makati and The Peninsula Manila. Alternatively, you could stay in Alabang, 11 kilometres (7 miles) to the south of Taguig, where you'll find the The Bellevue Manila and Parque Espana Residence Hotel. Should you choose to stay in Alabang, set aside some time to visit the Baliton Beach and LazerXtreme. Before you head home from Manila, why not make sure you catch local game. Visit Smart Araneta Coliseum to the north of Taguig. For those who are keen on booking accommodation nearby, make a reservation in the Edsa Shangri-La, Manila or Oakwood Premier Joy-Nostalg Center Manila. If you are traveling into or out of Ninoy Aquino International Airport and choose to stay nearby try Manila Marriott Hotel or Fairmont Makati, Manila. What are the most popular Taguig hotels? Are there hotels in other cities near Taguig? 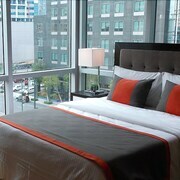 What other types of accommodations are available in Taguig? Explore Taguig with Expedia.ca’s Travel Guides to find the best flights, cars, holiday packages and more!